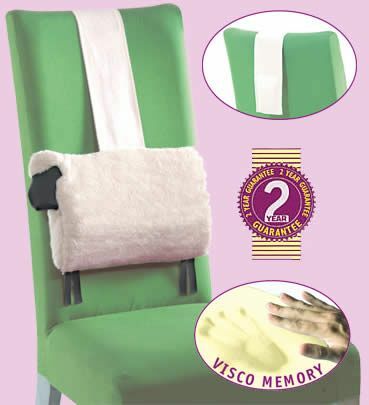 Memory Foam Lower Back Lumbar Support System. A new lumbar support for lower back pain disguised as a sheep! Designed to fit into the curve of the spine, using the latest visco-memory material originally developed by N.A.S.A. This material has a gel like feel with pressure relieving properties for comfort and support. Place back support over your chair and adjust up or down until maximum support is felt in the lower back, the simple counterbalance holds the cushion in place. I bought this for someone else, who says it has made all the difference to her backache. This is the second one I have bought in the past 2 years, so that it can be put on another chair. Sadly the second order came without any feet, but it didn't really matter.